Some of the freshest seafood from the east and west coasts converge in the heart of downtown. : Executive chef Richard Triptow (The Mansion Restaurant at Rosewood Mansion on Turtle Creek) helms the kitchen at this spot in the heart of downtown’s Main Street. The first thing you'll notice is the über-modern design of the space. A crisp white setting washed in cool shades of light blue is the perfect foil for a meal teeming with freshness. 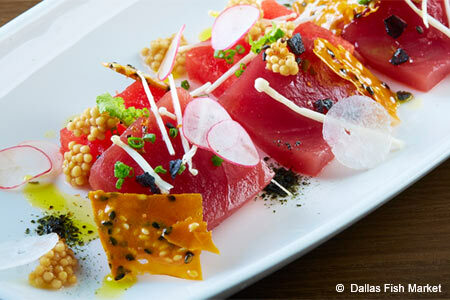 While the focus might seem to be on fish, Dallas Fish Market actually excels equally as a steak, sushi and seafood restaurant. The dinner menu features caviars served by the ounce and a raw bar with a lobster cocktail with horseradish panna cotta, and main courses like ginger-miso white soy swordfish in a green apple-curry nage or pan-seared Alaskan salmon with green curry udon. There are ample sushi, nigiri and sashimi options, and carefully selected “turf” choices, too, such as Wagyu Kobe beef and grass-fed lamb. It's a sophisticated menu that's executed with finesse. Contemporary wine, saké and Champagne selections are well thought out.